Little fish, little fish, swimming in the water. Duuuuncha worry. I’m not going to drown your ears out with another song. But I will say, the day I made these tacos I introduced the babelets to The Little Mermaid. Not the movie (just yet), but the soundtrack! THE FISH ON THE LAND AIN’T HAPPY. THEY SAD ‘CUZ THEY IN THEIR BOWL. I used cod this time because I was sick of tilapia. And my sis-in-law scared me saying it was the dirtiest fish in the whole world. I mean under the sea. Do you like tilapia? Because I do! Now I’m ruined. Am I gross? I’m gross. Ugh. Whatever. I like tilapia. And Sebastian. I guess the seaweed is always greener in somebody else’s lake. The cod is awesome, yeah yeah. But it’s the yogurt/lemon/dill marinade and the roasted poblano salsa (er, sauce?) that’s off the hook. (not sorry) A little prep work early in the day and dinner comes together in a splash. UP ON THE SHORE DEY WORK ALL DAY. OUT IN THE SUN DEY SLAVE AWAY. This weekend! Make it happen. 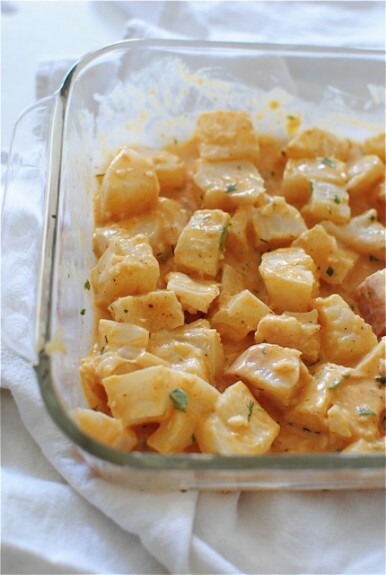 Pat the cod dry and cut it into 1-inch cubes. Place in a shallow bowl or dish. Whisk all the marinade ingredients together and pour over the fish. Cover and chill for about an hour (up to three). Turn your oven to broil. Place the peppers on a baking sheet and broil until the peppers are charred and black all over. Remove and place in bowl or plastic bag. Seal or cover and let steam for about 10 minutes. Then remove the skin and seeds. 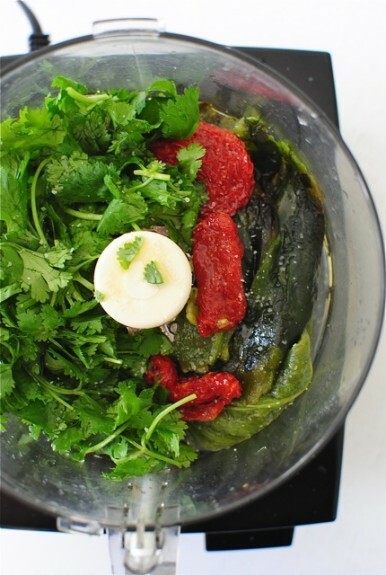 Throw the pepper strips into a food processor, along with the cilantro, lime juice, olive oil and sun-dried tomatoes. Add a pinch of salt and pepper. Pulse until blended. Chill the salsa until ready to serve. Heat a large sauté pan over medium high. Using tongs, remove each piece of fish from the dish, shake off any excess marinade and place in the pan. You don’t need to add oil to the pan because there’s so much liquid in the marinade, it would braise your fish otherwise. Once the fish is all in the pan and you discover there’s still too much liquid, just spoon out as much as possible (or tilt your pan to drain it. carefully!) Sear the fish on both sides until you get a nice brown color and the fish is flakey, about 7 minutes total. To serve, grill or warm your tortillas, and load ’em up with fish and the chilled poblano salsa. 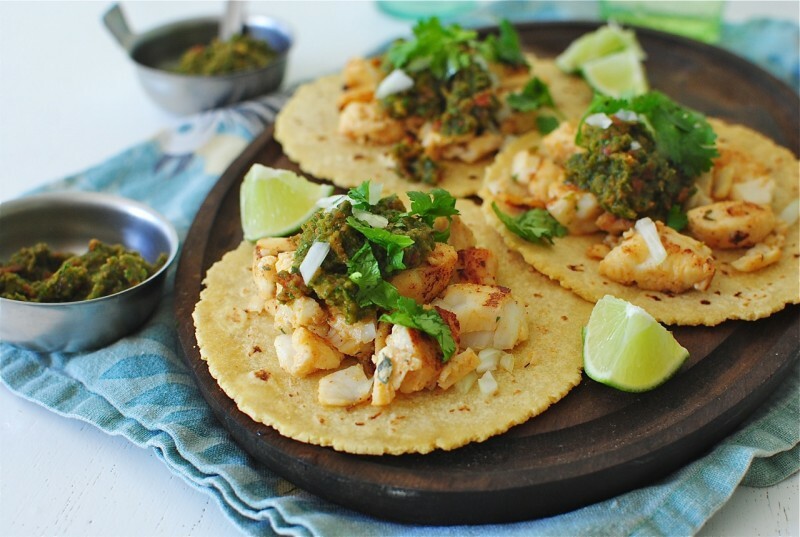 Garnish with fresh cilantro and diced onion. Serve with lots of lime wedges because good heavens. *if you prefer to grill the fish, just cut the cod into strips and marinate the same. That way the fish won’t fall through the grill. Ha-bam. WE’VE GOT NO TROUBLES, LIFE IS DEE BUBBLES UNDA DA SEEEEAAAA. I heard the same thing on tilapia, so cod it is! Roasted Poblano Salsa sounds out of this world! 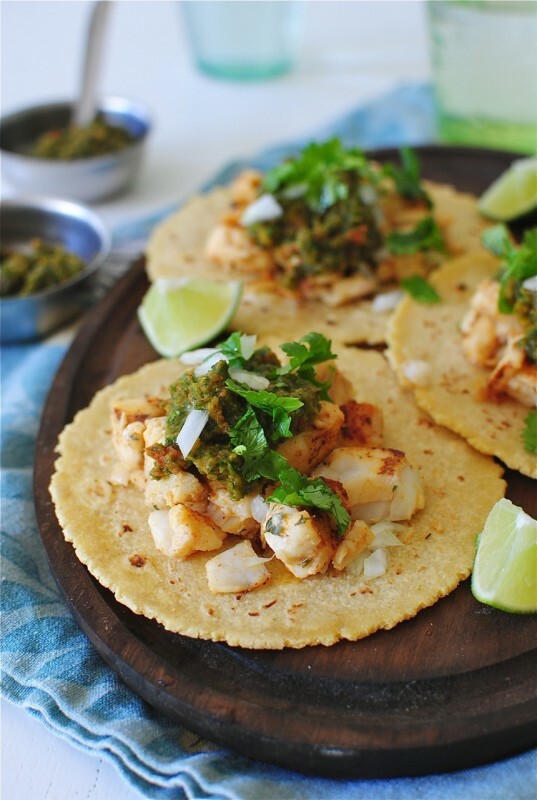 Adding these to the menu and that salsa sounds out of this world! I love fish tacos! Actually, I used to eat a lot of tuna tacos. But cod sounds just as delicious! I used to love The Little Mermaid! And now "Under the Sea" will be in my head for 10 straight days. Oh, I am SO making this happen. Bring on the poblanos. I'm ready for you. Ps I'm loving the sun dried tomatoes in there. Hahahahah! I've heard the exact same thing, but for some reason I can't stop eating shrimp. I'm disgusting. Dirty fish story reminds me of all the infertile pigs used to make Italian sausage - lol. PS: I want 100 of these. PPS: Why are your corn tortillas so dang cute? You had me @ fish tacos...the marinade and salsa were a bonus! 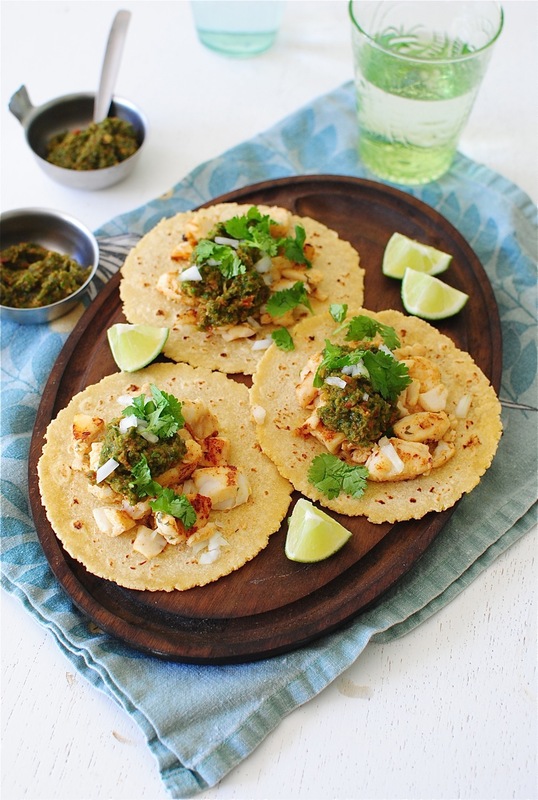 What corn tortilla are you using? Those look delicious as well! They're from Trader Joe's! SO so good. They're from Trader Joe's! I've actually never made my own tortillas, but have always wanted to try. One day! 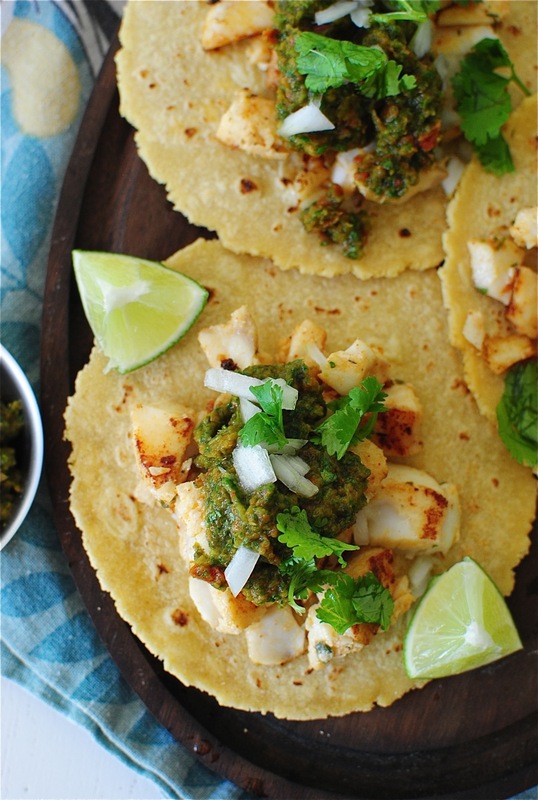 I looooooove fish tacos, every time its taco night, I make a small batch of fish for myself. Love this! My biggest problem with tilapia is that it is generally farm-raised, so usually tastes mushy to me. I'm a big fan of cod, though! And fish tacos. So this looks delish. Thanks! Hi Bev my family and I love fish tacos. We have tried fresh Cod but prefer Alaskan Halibut. My teenager says, “It’s all in the marinade” which I cannot disagree is a contributing factor but all of the ingredients play an important part. Emily stated about Tilapia that was farm-raised usually taste mushy, but we have other experiences with a local grower to be the opposite. It’s still not our preferred fish but open to try anything. Sort of got side tracked from this post but wanted to leave a commit that we liked your recipe and wanted to let others to give them a try. You’ll be happy you did. Can I eat this for a midnight snack? Best. Soundtrack. Evah! You gotta love the clickty-click of Sebastian's little claws. These tacos look wicked tasty. Made this. Ate it. Loved it. You should make it too.